By the end of 1848, 6,000 Americans and foreigners of many countries, statuses, classes and races had rushed to California for gold. Some 80,000 people arrived in 1849 alone. The greatly increased population, along with the wealth of gold, contributed to the creation of many new roads, bridges, farms, and businesses. Farming communities also enjoyed prosperity, thanks to the large number of miners that could not produce food for themselves. The transcontinental railroad was completed. Following completion, farmers realized they could feed people outside of the state with ease. The railroad provided growers with access to markets in the Midwest and Eastern seaboard, where California fruits and vegetables were in constant demand. There was a fundamental transformation of agriculture during this period of time. 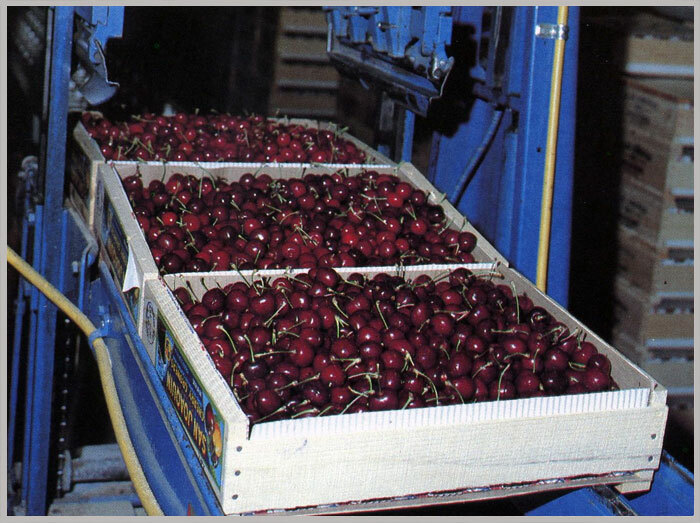 The growth in fruit shipments was rapid and increased five-fold from 1890 to 1910. In 1880, there were a total of 4 million plum, peach, apricot, apple and pear trees in California. In 1900, the total reached over 27 million. The most phenomenal growth was in oranges, from two navel orange trees planted in 1873 to 5.5 million orange-bearing trees in 1900. 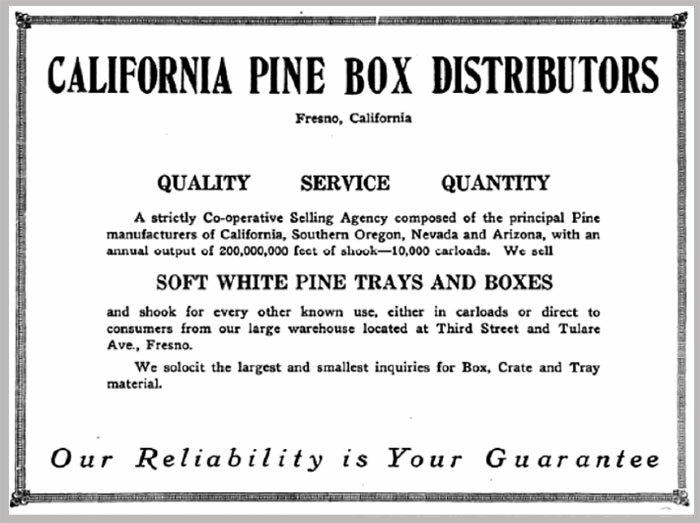 Calpine Containers was organized in 1895 under the name California Pine Box and Lumber Company, as a cooperative marketing association by several key manufacturers of packaging materials. They formed for the sale of lumber by-products, predominately box shook, to serve the industrial and agricultural packaging needs of the Western states. Small ditch irrigation systems and newly formed districts, under the Wright Act of 1897, expansion of surface-water irrigation acreage occurred, followed by the 1890 invention of the centrifugal pump, which allowed the early 1900s expansion of groundwater. The California Fresh Fruit Exchange was incorporated. 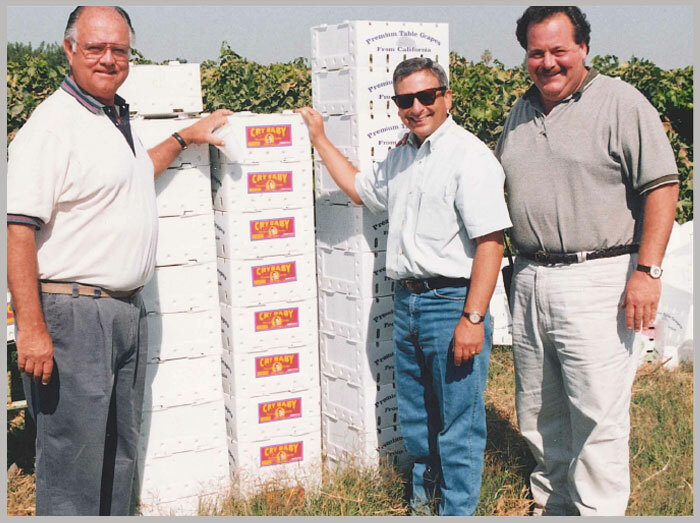 The exchange growers shipped their fruit in wooden boxes made with box shook. 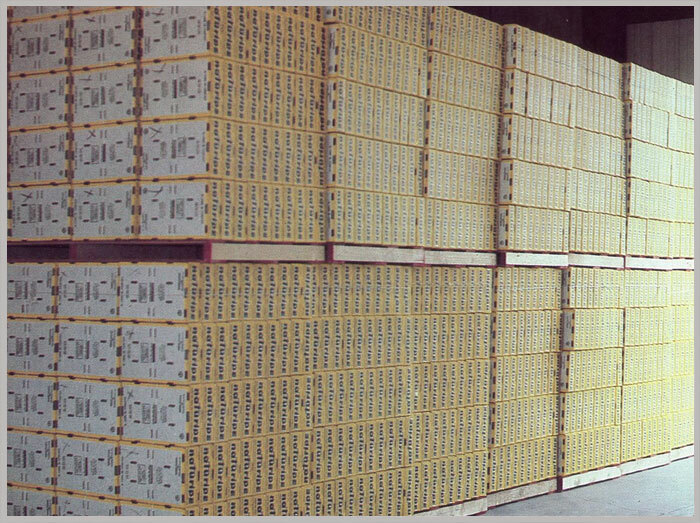 At box factories in California's pine region, suppliers cut thin slats and thicker box ends from kiln-dried lumber. As the market grew outside of California, Santa Fe developed a massive fleet of refrigerator cars. The Southern Pacific and Union Pacific Railroad joined together to form the Pacific Fruit Express. Farm products from California could now be shipped throughout the country, with western railroads carrying virtually all of the perishable fruit traffic. Under its original name of California Pine Box Distributors, it had a sufficient membership in number and size to warrant a court imposed divestiture of specific lumber operations. Although during 1907 to 1912, the company only distributed wooden packaging and handling materials, it was again required in 1912, due to member company size and market share, to divest a portion of its shook sales. Parallel to the operations of the cooperative, an asset holding company, Pine Box Realty, was incorporated. As a stock corporation, Pine Box Realty held the major fixed assets of Calpine and contractually leased the assets annually to Calpine. Calpine became a member of the Western Growers Association when it was formed in 1926 and today, is known as the oldest member. 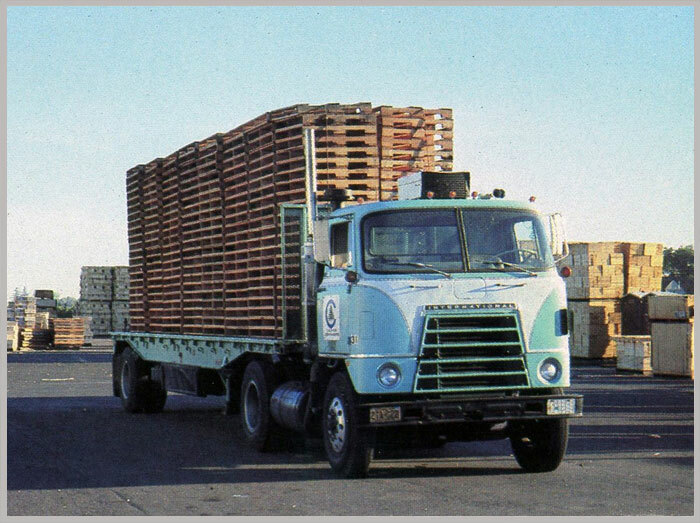 The association was incorporated under the laws of the state of California as an agricultural cooperative with the name of California Pine Box Distributors. The company opened its cooperative to the marketing of corrugated containers as a non-member product. This was apparently over the objection of some wood members who were adamant that "cardboard should not be encouraged as an alternative to wood." 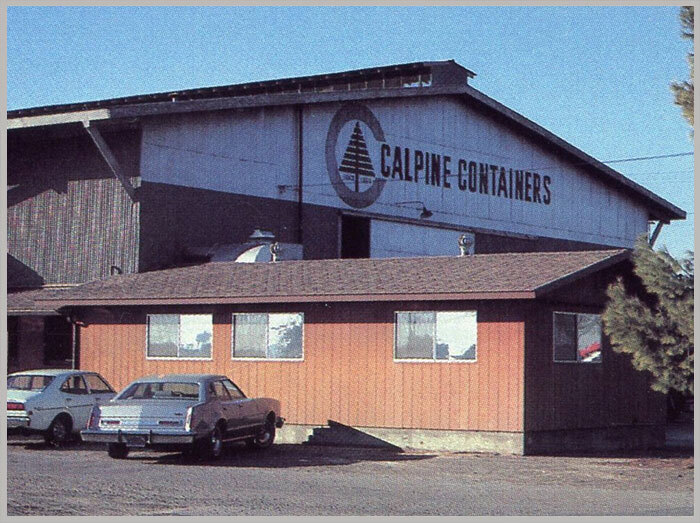 The cooperative changed its name to Calpine Containers as the industrial and agricultural packaging market converted from wood to corrugated containers in the early 1960's. 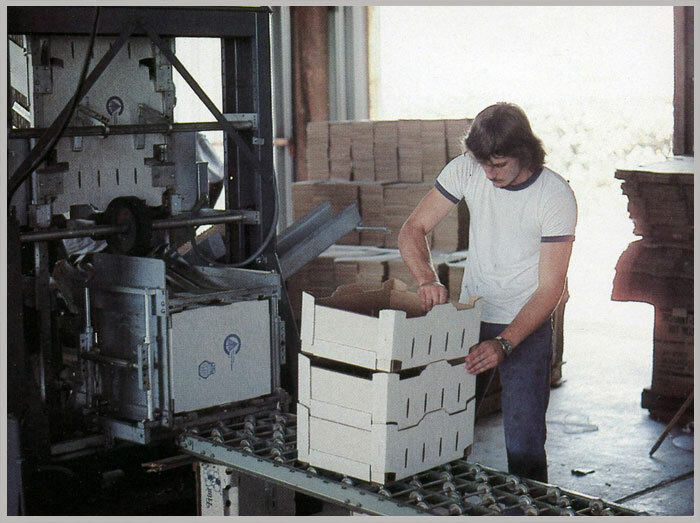 As the use of corrugated containers increased, it was no longer possible for Calpine Containers to operate as a cooperative. 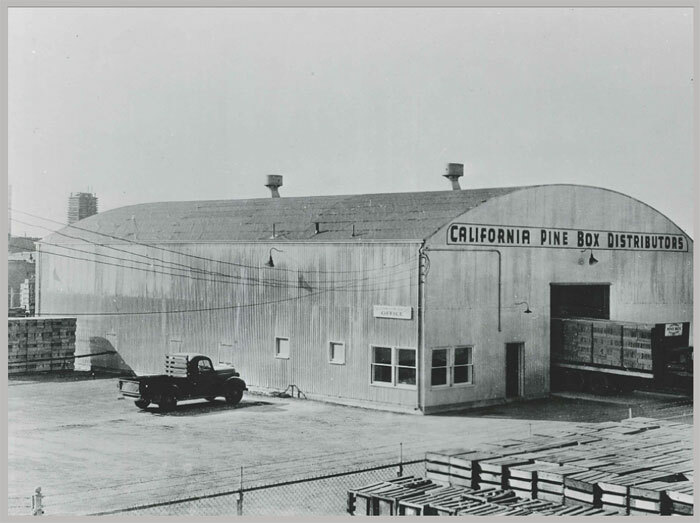 On June 1st, Calpine Containers and Pine Box Realty Company were incorporated and became what it is today, Calpine Containers, Inc.
Calpine celebrated being part of the industry for 100 years. Calpine Containers, Inc. moved its corporate office to the valley from the bay area for the first time. 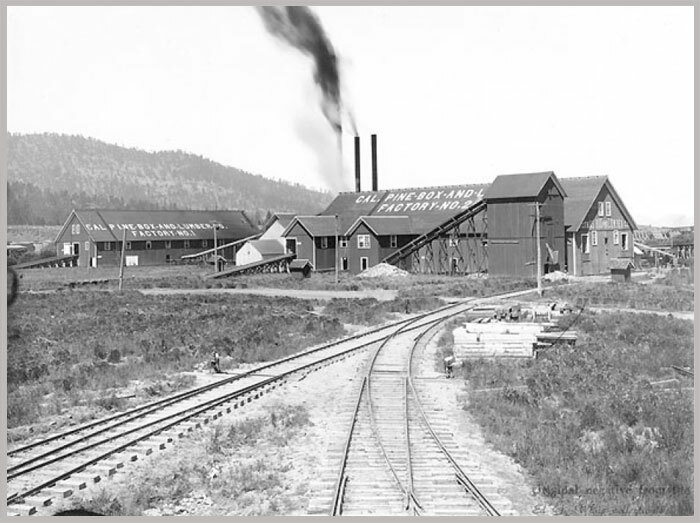 Calpine felt the valley was where they belonged - closer to the people who matter most, our customers. Calpine continues to evolve with vast knowledge of the industry and experienced employees. 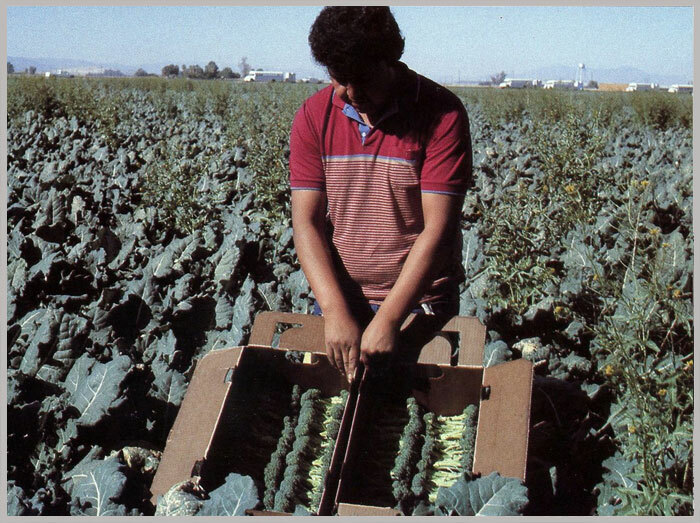 Calpine prides itself on service, as they have given customers' produce protection from field to market for over 115 years. Little wonder that Calpine proudly terms itself "the Best of the West."